Retailers, would you like a more professionally managed digital printing partner to work with? Would it help make your printing projects easier if you had a creative, efficient and reliable team supporting your marketing activities? Well, look no further, that’s exactly what CSDPrint is here for. We work extensively with retailers of all types and sizes across the whole of the UK and fully understand the challenges you face. We appreciate how important it is for you to have the highest quality displays and eye-catching promotional products possible. So if you need shop front signs, window manifestations, in-store posters, display units, complete point-of-sale campaigns including strutted cards, shelf edge stickers, wobblers and pallet wraps or any other digitally printed retail materials, we can help. We know that great looking retail displays and marketing campaigns underpin the success of your business and so we have worked hard to develop the ultimate retail printing service. CSDPrint works with many leading high street brands as well as lots of smaller independent retailers. Our clients tell us that what they like best about working with CSDPrint is the seamless team approach we have. We pick up the design-brief-ball and run with it, all the way. Leading luxury cashmere retailer Pure started online and now also has eight boutiques, 30 concessions in John Lewis stores across the country and an outlet. The premium brand has built an enviable reputation for its stylish, top quality clothing. Pure Collection came to CSDPrint for help with their in-store marketing. They were looking for a hands-on print partner who would not only be able to guarantee exceptional quality but could manage all aspects of their fulfilment requirements too – collating, dispatching, ensuring safe delivery and fitting at each boutique. This is an intensive print project to manage because Pure Collection is highly pro-active with its marketing. 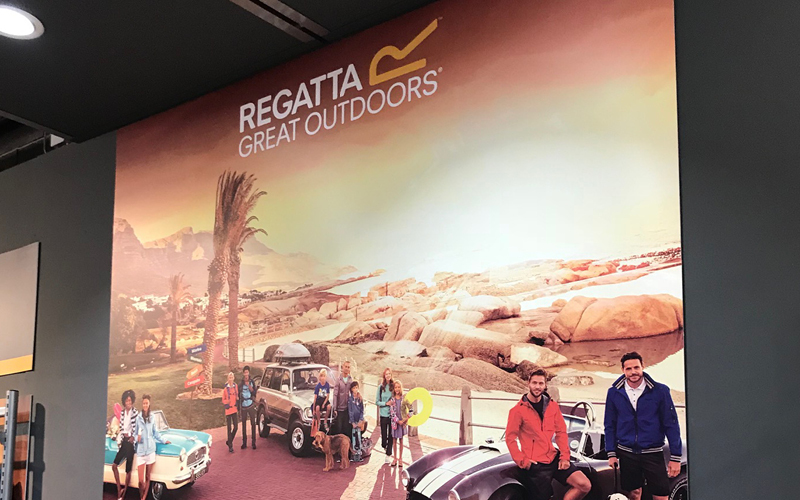 CSDPrint produces new campaigns each month including window vinyl graphics of various sizes and a full range of high-end internal point-of-sale materials. The show cards, hanging graphics and posters are absolutely top notch; only the very best substrates and print finishes are used to make sure everything is up to the fantastic quality Pure Collection expects. Collating, dispatch and delivery is carefully co-ordinated to ensure each boutique’s specific requirements are met. For example the boutiques vary in size and therefore need different configurations of materials in line with the number and size of their windows and display units. Pure Collection has chosen prime high street locations in appealing shopping destinations such as York, Shrewsbury and Guildford and therefore deliveries and fittings need to be carefully co-ordinated, often out of hours, to avoid busy periods. Developing individually tailored fittings plans to suit the needs of each boutique.